See what I mean? I took 10 random variables from a Normal distribution with mean 32 and standard deviation 5, 12 random variables from a uniform (0,1) distribution, and 30 random variables from a Binomial (10,0.2) distribution, and calculated the sum. 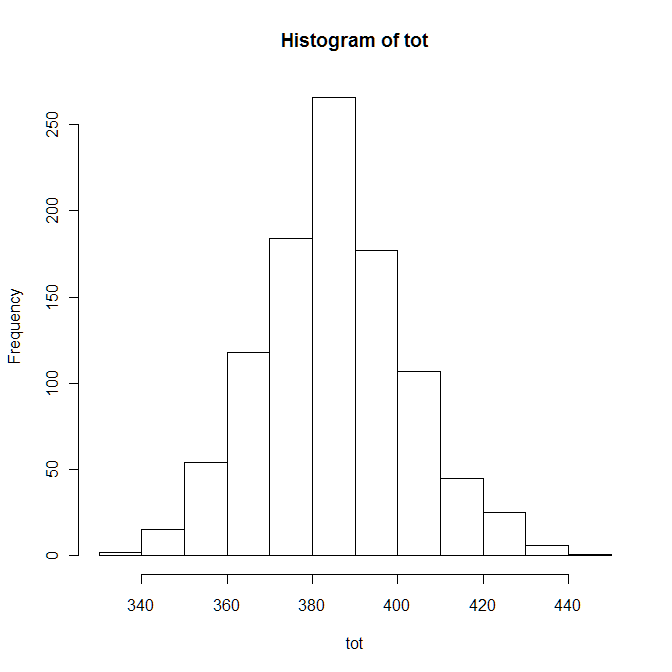 I repeated this a 1000 times and then made a histogram of my sums. The shape looks like a Normal distribution, does it not? Now this is NOT a proof of the Central Limit Theorem. It's just evidence of its truth. But I think it's pretty convincing evidence and a good example of why the Central Limit Theorem is truly central to all of statistics. This entry was posted in Simulation, Using R on September 14, 2011 by Clay Ford. I have some thoughts. According to CLT, random sampling of any statistic will eventually result in normal distribution of that statistic. But why this not apply to F statistics? I did bootstrapping of F statistic on 10000 samples, and I still got skewed distribution of F statistics. Notice the difference between the two. The first is just a histogram of 1000 F statistics. 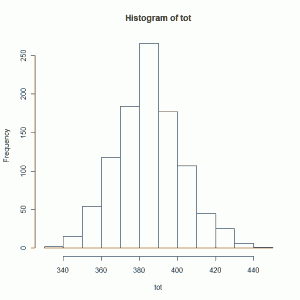 The second is a histogram of 1000 sums of 20 random F statistics.